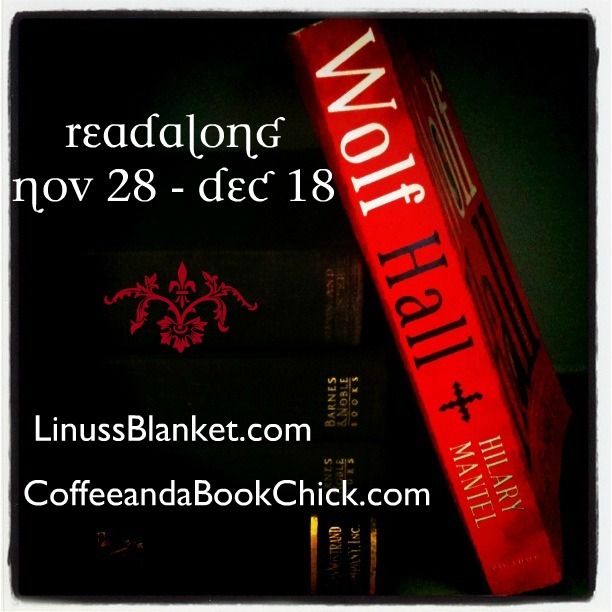 I am so excited to be co-hosting with Nicole from Linus's Blanket the readalong of Wolf Hall, by Hilary Mantel, the 2009 Man Booker Prize winner! It's a beast of a read, so we thought we'd split it up into a 3-week schedule. Participants can do a progress post each week instead of answering a list of questions. The recent announcement from HBO and the BBC's collaboration to create a four-part miniseries with UK indie Company Pictures should motivate you to pick this one up of your shelf! I'm drooling!! I'll get my link up soon...trying to decide whether to get paper or download this one on my Nook...can't wait!! I haven't written my start-up post yet but I am totally doing this. Can't wait! I wish I had been part of a read-a-long when I tried to tackle Wolf Hall last year. Good luck with your reading. Strange, I was going to post on Twitter yesterday so see if anyone wanted to read this with me... honest! I'm in. I actually bought the hardcover the day is was released. Brilliant! This book has been on my shelf for far too long. Every time I walk past it I feel wistful. Thanks for hosting the perfect Thanksgiving readalong! Hello I read the book in the month of August, but start reading again the book 2 days ago, I am in page 91,its great. ahhh, i wish i had the time to tackle this beast right now...in the midst of judging inspy's at the moment and trying to get my head above water on review books....mmmm, is that even possible?!? I have had this book for the longest time, and so want to read it, so I am going to have to seriously consider this readalong. What a great choice! I need to see if I can do this! Ooh, didn't know that about the HBO/BBC collaboration on this one. Best of luck! I really want to read this some day, but the holiday period would be no good for me. Still, I hope your posts will motivate me to finally pick it up next year. This sounds like fun-I have too many commitments now that the holiday season has begun. I am infuriated about the entire Jack situation. It is truly outrageous. This is a biggie, but I'm going to give it a shot. Looks like a wonderful book.